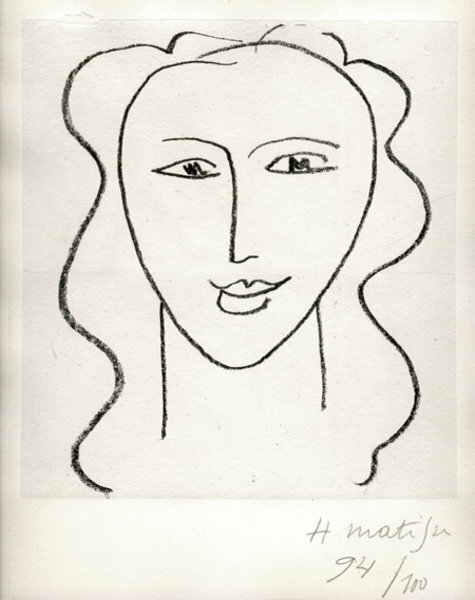 Reference: Henri Matisse, Catalogue Raisonee de l’oeuvre grave, Claude Duthuit, Vol I, number 638. See Also: Henri Matisse “La Chapelle de Vence”: Journal d’une creation. This work is a lengthy dissertation on the entire project of the building of the Chapel. Condition: The Rives paper in good condition. The Chine applique with some paper loss, bubbling , folds and repaired tears. Note: This work was amongst those made by Matisse whilst he worked on the huge project of designing the Chapelle of St Paul de Vence which was a commission for the Dominican Nuns. In 1942 Matisse was suffering from a grave sickness: Sister Jaques-Marie (Previously Monique Bourgeois), a young nurse looked after the artist as he made his recuperation. He suffered badly from insomnia and the Sister helped him at that time : they became very good friends. Later Sister Jacques-Marie made her vows to the Dominican order in 1946 and began again to see her friend Matisse. She spoke to him of the chapel in course of rebuilding. Later she introduced him to Brother Rayssiguer who was in charge of the project and the co-operation between the two men eventually resulted in a small masterpiece of Religious art and superlative architecture. Matisse was responsible for the frescoes on the walls, the design of all the interior furnishings and church furniture. Matisse worked for 4 years (1947 - 1951) on the project and he described it as “The Masterpiece of all my life”. These were sold by the Chapelle to raise funds and we are told that this is the original provenance of our piece. 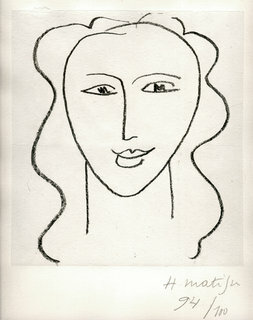 Matisse made a series of portraits of studies of the virgin for the the project. There were 10 portraits in total including this one . Other works made for the project included 9 studies for the Mother and Cild and 5 studies for St Dominique. The chapel can be seen today and it is an extremely beautiful whole of superlative art and architecture.